When Linda Lewis Raney and her husband Holly moved to the hills near Oxford they brought their deeply ingrained Delta hospitality with them and it has blossomed in the shadow of Ole Miss. “Heaven on earth,” some would say. Nestled on the edge of Holly Springs National Forest, just ten miles from the Oxford Square, their version of Delta hospitality includes a growing bed and breakfast trade plus a spectacular party barn. And the possibilities seem endless. Holly and Linda both grew up in the Delta, 45 miles and 20 years apart; Holly in Greenville, and Linda in Belzoni. Twenty years ago they lived in Jackson, raising their daughters, Michael and McKenna. Taking every opportunity to be outdoors they went camping and canoeing often, assuming they were permanently grounded in Jackson. “I do believe in love at first sight,” Linda said. “We first came to Lafayette County to visit an old friend of Holly’s. By the time we drove halfway down the old country road, I was hooked. The four of us visited so many times that autumn, invading the child-free zone of their home. They kindly offered to sell us acreage, probably to regain a little privacy,” she laughs. Soon the families were neighbors. “Holly didn’t even have a job in Oxford at the time and commuted back and forth to Jackson for months,” Linda adds. The Raneys jumped into country life, quickly collecting a herd of ponies and horses, a few minor injuries, and a lot of stories as they learned from their kind and incredibly patient neighbors how to be country people. As time went on and opportunities arose they developed the property. Today their Lafayette County compound includes their primary residence, the bed and breakfast, a party barn and other out buildings designed by Carrollton’s Jonathan Mattox of Howorth and Associates Architects, Oxford. Their home was designed as a series of three cottages, connected by hallways because Linda didn’t want to be faced with looking at the empty bedrooms once the girls grew up and moved out. This is where their business began. The built-in privacy of the kids’ cottage was perfect for paying guests and the name Empty Nest was a given. Linda was pleased to put her business management degree to work, and Holly reveled in living so near his alma mater. Both enjoyed meeting guests and extending their own style of Delta hospitality. The Empty Nest, however, was only two bedrooms with a bath and a half, and Linda realized she spent more time politely replying, “Sorry, we’re booked,” to inquiries than she spent actually making reservations. In 2011, they built The Nest Egg BnB, a three bedroom, three bath cottage across the gravel drive from their home. 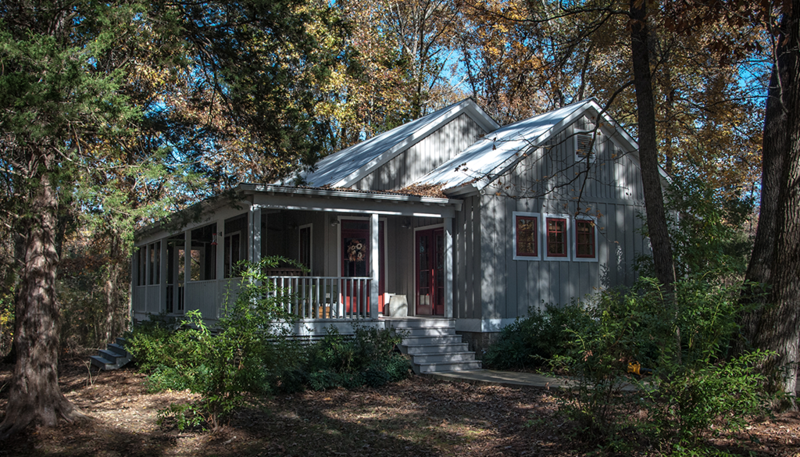 Unlike most bed and breakfasts, the cottage was designed and built to function as a rental for multiple guests. Each room has its own exterior entry and mini-kitchen facilities. There is a common room with fully appointed kitchen, den and dining space. Soundproofing interior walls insures a peaceful and private experience for the guests. The house can be rented as a whole or each room separately. Its farmhouse/cottage decor gives the quaint feeling of a long lived-in property and is in perfect keeping with the hobby-farm experience available to the guests. The chicken coop, which can be seen out the back door, is populated only by quiet hens. The morning view includes all eight horses drinking from the water trough, while the backyard fire pit adds quiet enchantment to any night. Although Linda runs the operation while Holly still goes to his law office, the BnB is truly a family run enterprise. Daughter McKenna is the manager, Linda’s sister, Gwen, is the bookkeeper and Michael who now lives in Austin, is their valuable, if off site, marketing consultant. “It gets kind of awkward when your mom introduces you as the manager and forgets to mention you’re also her daughter,” McKenna points out. Recently, Oxford’s vacation rentals have almost caught up with the lodging demands of a vibrant university town and the Raneys converted their horse barn into a wedding and event venue. Oxford is a wedding destination town and this fits nicely with the bed and breakfast. Brides usually have out of town guests and the convenience of spectacular on-site rooms is always appreciated. “This wedding business is fun and keeps a bit of romance in the air. We do everything we can to keep the parties low key,” Holly chuckles, “but I did find a woman’s undergarment in the fig tree one morning after a wedding.” “The parties aren’t usually that raucous but we can see that everyone loves the place and how well put together it is. People always compliment me for all it took to make the barn so special and functional, but the credit really goes to Linda,” he adds. Linda gives most of the credit to Jonathan, the architect. “There is a special sense of place out here, a peacefulness that comes from having an expert pick the site for every building, right down to the woodshed,” she says. Needless to say, Holly and Linda have been camping only once in the last 21 years. They wake up to the great outdoors through every window, porch and view and are drawn outside by the cats and dogs and horses. And the chickens. Life in the hills is good to this Delta family.